Includes the original Transfer Factor XF® ingredient for excellent daily immune system support. Used for years by millions of people worldwide for increased immune support. Delivers effective, reliable immune support with transfer factors from cow colostrum. Shown in independent studies to increase immune cell activity by 204 percent. Each day you come in contact with thousands of germs (bacteria and viruses)—in the air you breathe, foods you eat and objects you touch. But, you have an amazing protection mechanism that defends your health against these germs and other elements that can make you sick, your immune system. Your immune system is a complex network of organs and cells. It works around the clock to defend your body against health threat and disease, and the ever-increasing environmental threats in today’s world. Quality immune support has become essential to maintaining optimal system function and promoting long-term health. 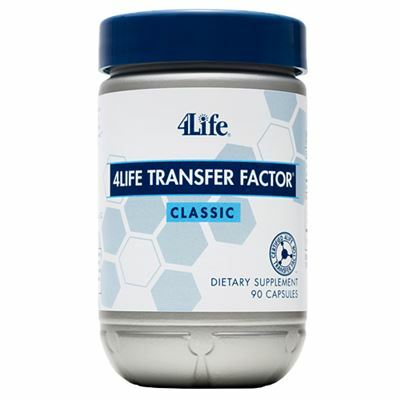 4Life Transfer Factor Classic is an exclusive supplement on the forefront of nutritional science. It’s been recognized for years as the best colostrum-based transfer factor product for daily immune system support. Unlike other immune ingredients that simply boost the immune system, 4Life Transfer Factor Classic tailors its approach to what your body needs—boosting or balancing. "I started taking 4Life Transfer Factor over a year ago. At the time, I suffered from frequent problems with my throat. I really feel like Transfer Factor has helped support my immune system to be able to deal with this difficulty. I have recommended it to several people." "I am twenty-six years old. I was born legally blind in both of my eyes. Aside from having very bad vision I've always considered myself very lucky compared to most other people. I found out about 4Life Transfer Factor and how it has changed the lives of thousands of people all around the world. I was extremely skeptical about trying this product for myself. But curiosity killed the cat and I decided to try the product anyway because it was so unique. After taking the product for a few weeks I really feel like it has made a difference in my immune system, which has improved my quality of life. I feel like I have more energy throughout the day and it is easier for me to wake up in the morning. I can’t imagine not taking my daily capsules every day in the morning." "I had been experiencing many health challenges and really wanted to find a supplement which would help educate my immune system and assist me in my efforts to live a more healthy life. I became a believer in the 4Life products after taking 4Life Transfer Factor. I was so pleased with the way I felt and was excited about the product that I quit my regular job and started introducing others to the benefits of Transfer Factor. I have never been happier! Working with 4Life as a distributor has been the most gratifying and pleasurable job I have ever had! I feel absolutely blessed and elated that I am able to share the benefits of Transfer Factor and the financial rewards of 4Life with family, friends and people I meet!" My daughter Danielle is fifteen and has been taking 4Life Transfer Factor Classic for about a month. After the third week, she said that Transfer Factor was the best health supplement I had ever brought her. She went for a checkup at the doctors last week and he gave her a clean bill of health. She enjoys wonderful energy levels throughout the day.